struck a bargain with the Santa Barbara proprietor and paid for it over three months – the layaway plan for art. 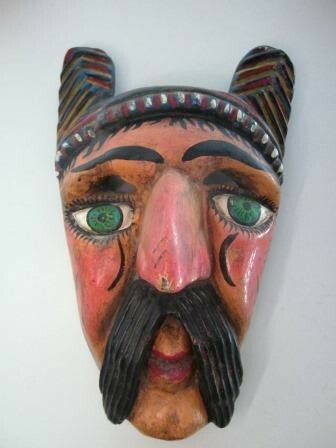 Today, that same mask hangs on our wall, at the center of our mask collection. We have bought sculptures, paintings, prints, drawings, and textile work from artists and galleries. The only criteria are that we love it and can’t imagine living without it. This work is intermingled with my own artworks, and our home is like a small museum with the art exhibited salon style. We do switch the art around and change the exhibition for our own pleasure. However, rarely have we deaccessioned a work of art. Nearly 40 years later, the collection now has a voice and personality of its own. Nearly every piece has a memory and story about how we acquired it, along with information about the artist. And this is essential, we seek to buy works most often directly from the artists, or at least with knowledge about the artist. For instance, our first trip to Mexico we purchased a crow, one of the papier-mâché and wire creations of Saulo Moreno Hernandez, who today is one of the pre-eminent Mexican artisans and has been featured in the MOMA publication, Twenty Centuries of Mexican Art. We liked its raw personality, and after several years added another of his pieces – a gallo, (rooster) to our collection. Ixtlahuaca. We met the Diaz family on a trip to Oaxaca when they were in the central square selling their wood carvings. We instantly connected when we realized that we had a family that had the same number of children that were the same ages, and were invited out to their home to have a Sunday meal with the family. 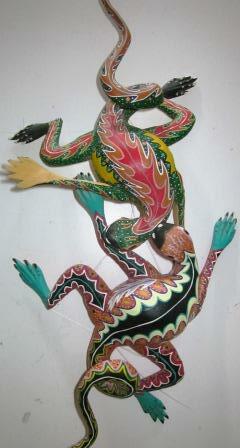 We have bought many pieces from the Diaz family on numerous trips to Mexico. 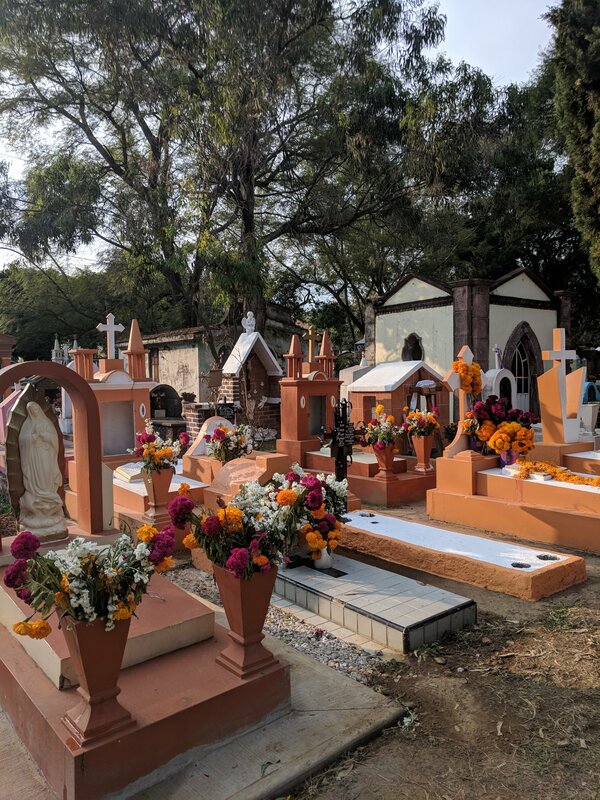 We remember when we look at these pieces that the entire family has a job in creating each of these wood alebrijes; from sourcing and carving the first wood structure, to the final delicate painting, every family member contributes to the piece. In 2018 we discovered another family of artists in San Martín Tilcajeta. The Fabían family work in a similar manner and their work is held in major international collections. We have purchased rugs from artists in Teotitlán del Valle and in 2018 added a piece from J. Isaac Vasquez Garcia and family in our collection. The rug is woven with handspun wool and colored with natural dyes created from cochineal, pericón, a type of marigold that changes natural wool into a pale yellow color, jarilla leaves that create a bright, fresh green, and tree lichen known as “old man’s beard” that changes wool to a pale straw color. One of our favorite pieces is a Huichol yarn painting bought on our first trip to Mexico, with the help of our friend, Robert Forman, who we also met on that first trip in 1992. We had heard from Robert that a Huichol yarn painting might be for sale when we were in Mexico City preparing to depart for home. On the night before we left, we were summoned to the lobby of our hotel by Robert, accompanied by several of the Huichol and discussed the paintings and other artworks we had seen during the day. At that point, we had no more pesos left but made an arrangement with Robert to send a check to his father living in New Jersey, who would reimburse the Huichols for the painting. We left Mexico that next day with an a stounding work of art that we have included in our collection – front and center. The moral of this story is to buy art that you like – don’t hesitate! Don’t rely on anyone else’s opinion, unless that person will also live with the art on a daily basis. Have faith in your preferences, and the only thing that might happen is that your eye becomes more discerning as you focus in on what art gives you the most pleasure.